Maker: Watson & Sons Ltd. This device is an 'object marker.' It is used to circle an area of interest on a slide or coverslip on a slide. It makes use of a small diamond. In use, the microscopist centers the area of interest, and then replaces the objective with this device. It is spring loaded. As the optical tube of the microscope is lowered onto the slide, the spring applies just enough pressure. The user rotates the diamond via the knurled ring. A small knob adjusts the size of circle the marker produces, though it is difficult to use the device if a very small diameter circle is chosen. 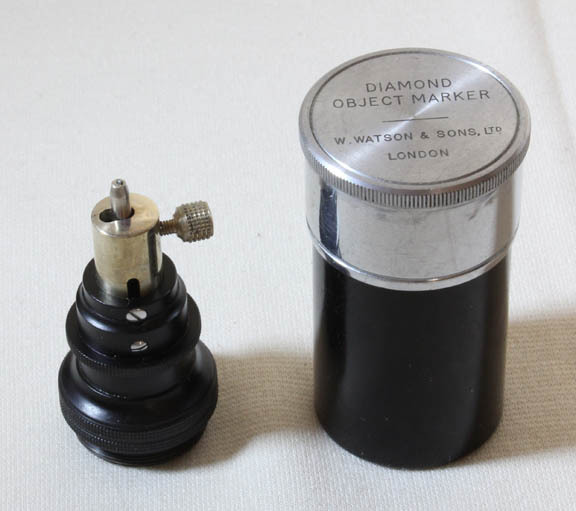 A diamond object marker, constructed by Ross was reported by W.K. 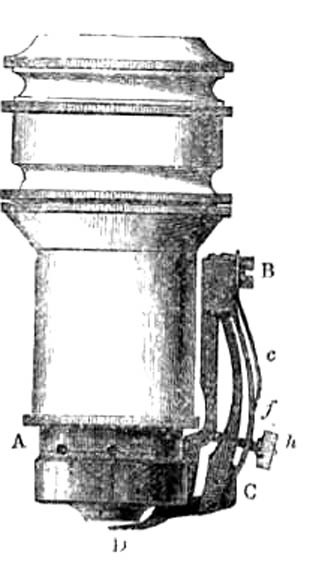 Bridgman in the Quarterly Journal of Microscopical Science, volume III, 1855, pages 327-329. This original version was attached to the outside of the end of an objective. It also served as a protective cap, covering the end of the objective. Like the much later type seen on this page, there was a small knob acting on a small screw which would adjust the diameter of the circle inscribed by the diamond. The version seen on this page was apparently first made by Leitz in the first decade of the twentieth century, and then copied by Watson. It is not listed in any Watson Catalog that I could find. 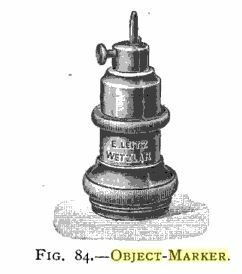 Another type of object marker also fitting on the nosepiece, and also dating back to the 1850's was used to simply stamp an area with ink. This stamping device obviously made a circle that was not as durable, though more easily seen with the naked eye than the diamond mark. In the twentieth century, Nikon produced a modern form of stamping object marker which is still sold in 2017.